This year Nottinghamshire Pride is on Saturday 26th July in the Hockley and Lace Market area of Nottingham City Centre. As a result of the route change we will now meet at 11:00am at the parade start point. Here’s a link to the Pride site info which features a route map for the parade. Please wear purple if you can, or any purple/bisexual coloured clothing and accessories. It might be a good idea to wear flat, comfortable shoes and check the weather report beforehand so you can bring your brolly or sun cream etc. if needed. After the parade finishes we will wonder round stalls and stages at Pride and go for lunch somewhere. This week unchartedworlds and I made some badges for BiTopia. Just three of each design to start with, though I quickly learned that we’ll have to make more with the duck on soon as they’ve sold out already! 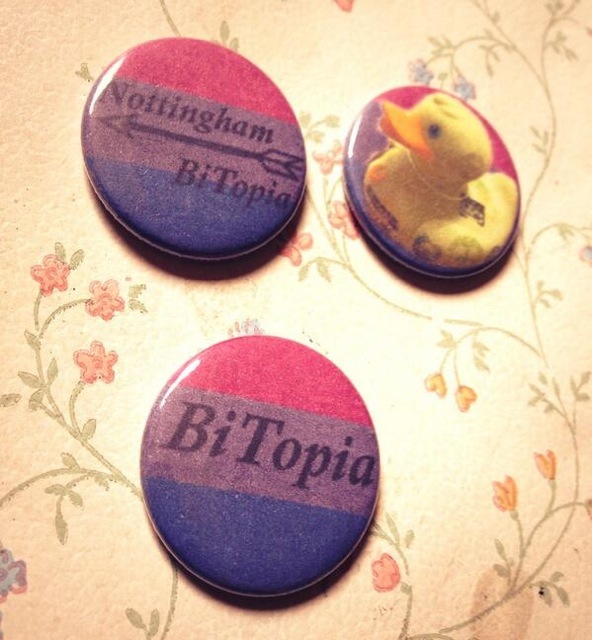 The badges cost £1 each and I’ll bring them to all future meet ups. Recently I made some A5 sized flyers to take to an event to promote the group. I thought they might be a useful resource to share online as people can print them off at home and distribute & display them easily at their own convenience. 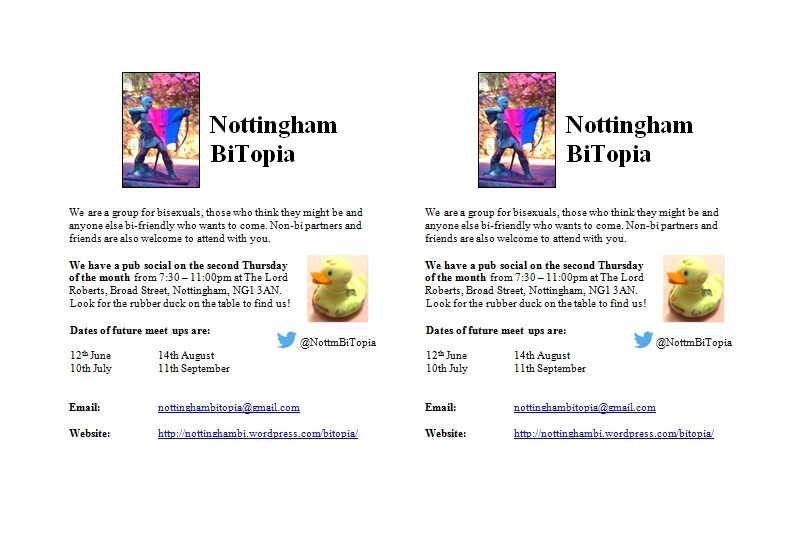 This will help spread the word about BiTopia to those who might benefit from it but either aren’t online or aren’t actively looking for this kind of group. It also means we can reach more people than I would be able to by myself: people can put flyers in places I can’t get to or don’t know about. Here’s what they look like. There are two A5 flyers on one A4 page. If you want to print some flyers to display anywhere then you are very welcome to. Just right click on the link below and then select “save as”. All I ask is that you let us know where you’ve put them. 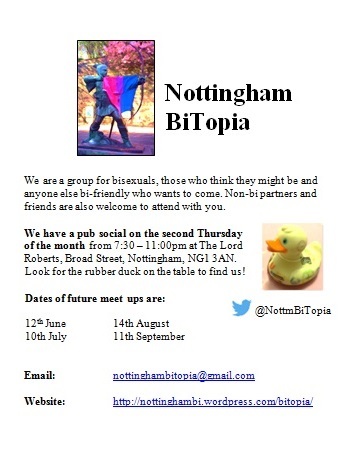 You can do this by either commenting below or emailing nottinghambitopia at gmail.com. Remember to get permission from the venue or event organiser before putting the flyers anywhere! I’ve also created a small picture file in case people want to save it, then post it as a photo to their Facebook page, twitter account, Pinterest board etc. Single flyer for posting online.